Alene: "Among the many photos in our archives is the one named "The Merrick Road in Winter." It looks as though the motorists are posing in front of a painted backdrop, rather than actually motoring down Merrick Road. I posted this photo on Cars of 1900 - 1930s on Facebook and most posters thought it was a one-off, homemade horseless carriage. A patron of mine who is a car enthusiast thinks that, because of the retractable roof, the light and the undercarriage, that it was not homemade, but made by a company in the late 1800s. This same patron suggested that I contact you to see if you wanted to weigh in and/or post this on your website for others to weigh in. Please have a look at this photo and let me know. Thanks so much! " Through the amazing research of Sam Berliner III and Ariejan Bos, Alene your Rockville Centre Mystery Foto is no longer a mystery. The "Montauk"was a 4-passenger gasoline surrey built by the Long Island Motor Vehicle Company in Brooklyn. This was thefirst vehicle built by this company and was designed by engineer Charles Rockliff. The Long Island Motor Vehicle Company was incorporated in New York State with $100,000 capital (equivalent to $2.8 million today.). The directors of the company were Rockliff, A.R. Pardington and F.G. Webb. -What was the date of the photo? Based on the caption of the photo in A.R. Pardington's archives, the image was taken on January 6, 1901 during the first road test of the vehicle. The road test was 63.5 miles from Brooklyn to Rockville Centre. Alene, this is the reason the photo is in the Rockville Centre archives! The photo was taken by photographer H.B. Fullerton, who later became director of development (PR) for the L.I.R.R. 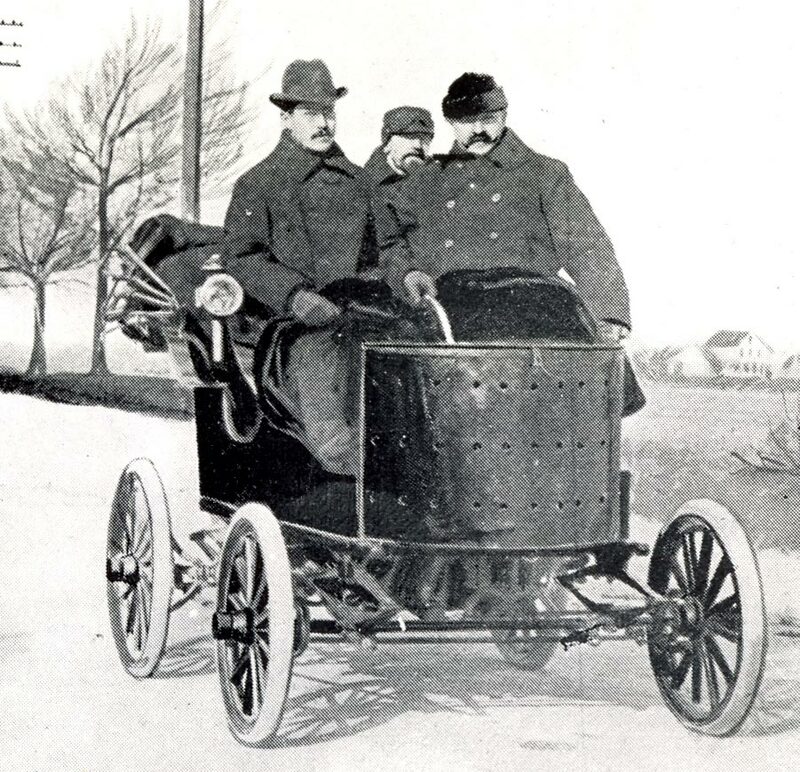 As described in Fullerton's 1901 The Automobile Magazine article (discovered by Ariejan Bos), there were four passengers in the vehicle during the road test; F.B. Webb (the driver). designer Charles Rockliff, Pardington and Fullerton. The rear passenger was A.R. Pardington. The fourth passenger was H.B. Fullerton who took the photo. Both F.G.Webb and A.R. Pardington were officials for the Vanderbilt Cup Races. 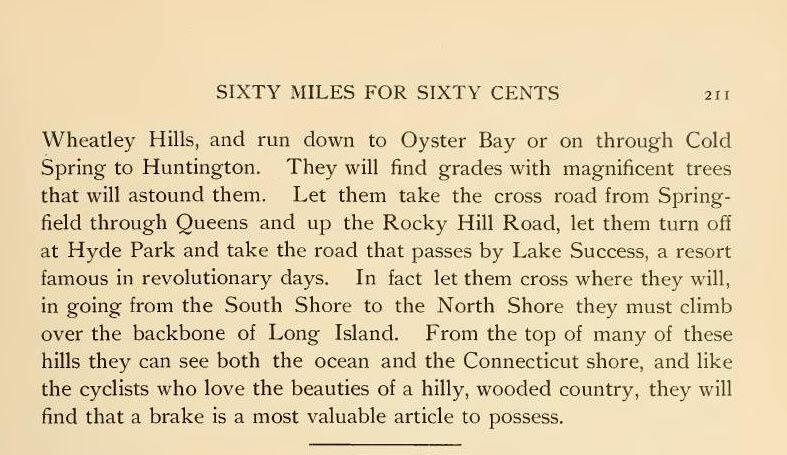 Pardington was the first general manager and a vice-president of the Long Island Motor Parkway. Kudos to both Sam Berliner and Ariejan Bos for their spectacular research in solving this Rockville Centre Mystery Foto! 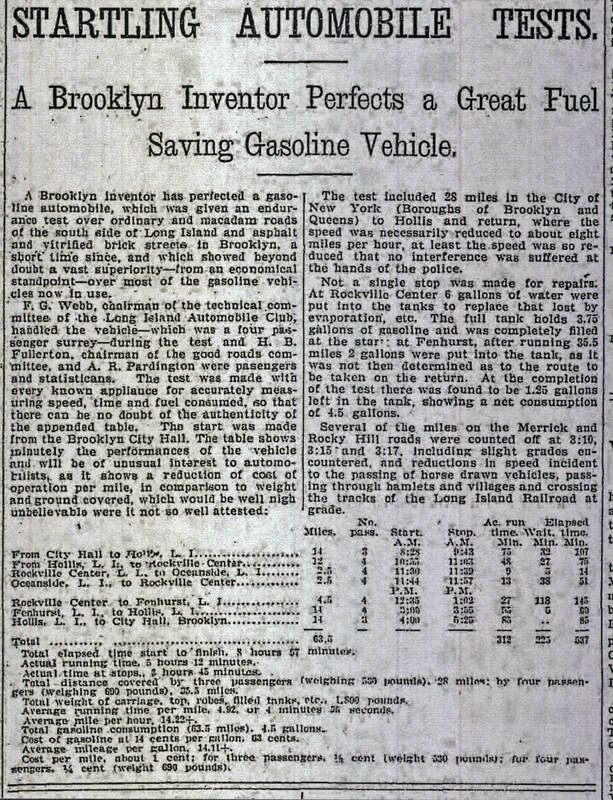 "A Brooklyn Inventor Perfects a Great Fuel Saving Vehicle." "F.G. Webb handled the vehicle during the test and H.B. Fullerton. chairman of the good roads committee and A.R. Pardington were passengers and statisticians." Standard Catalog of American Cars (1805-1942) by Beverly Rae Kimes and Henry Austin Clark, Jr.
"The company's principal activity was a garage for the repair of vehicles, but it stood ready to fill any orders form customers desiring to have an automobile built. 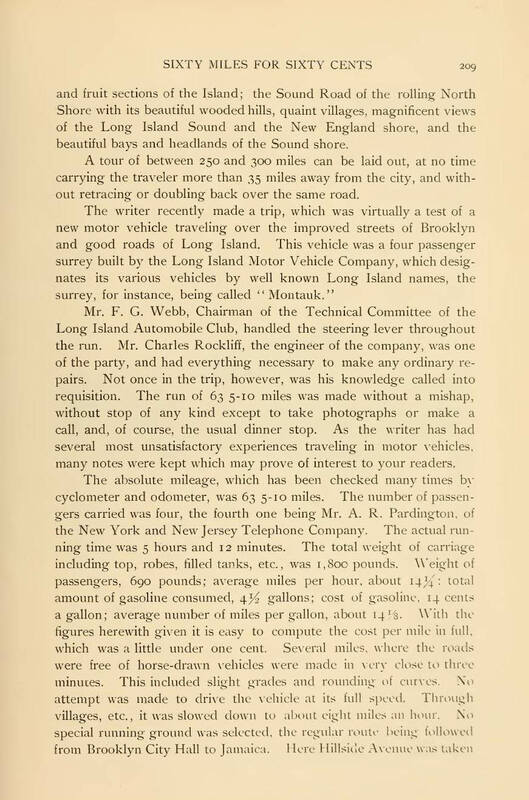 Early in 1902 Charles Rockcliff, who served as the firm's general manager, reported that two such cars were then being built.."
Found in the Pardington archives in the Handley Collection at the Smithtown Public Library. Reference: Sam Berliner III's wonderful website. Fullerton was looking for an American name for "automobilist and chauffeur." Merrick Road was described as "being almost level running through many beautiful villages." "The writer recently made a trip, which was virtually a test of a new motor vehicle traveling over the improved streets of Brooklyn and good roads of Long Island." "The vehicle was as four passenger surrey built by well known Long Island names, the surrey for instance, being called "Montauk." "Mr. F.G. Webb, Chairman of the Technical Committee of the Long Island Automobile Club, handled the steering lever throughout the run. Mr. Charles Rockcliff, the engineer of the company wasone of the party..."
"The number of passengers carried was four, the fourth beingMr. A.R. Pardington, of New York and New Jersey Telephone Company." The cost of gasoline was 14 cents per gallon! The average miles per gallon was 14.11. The average speed was 14.22 miles per hour. 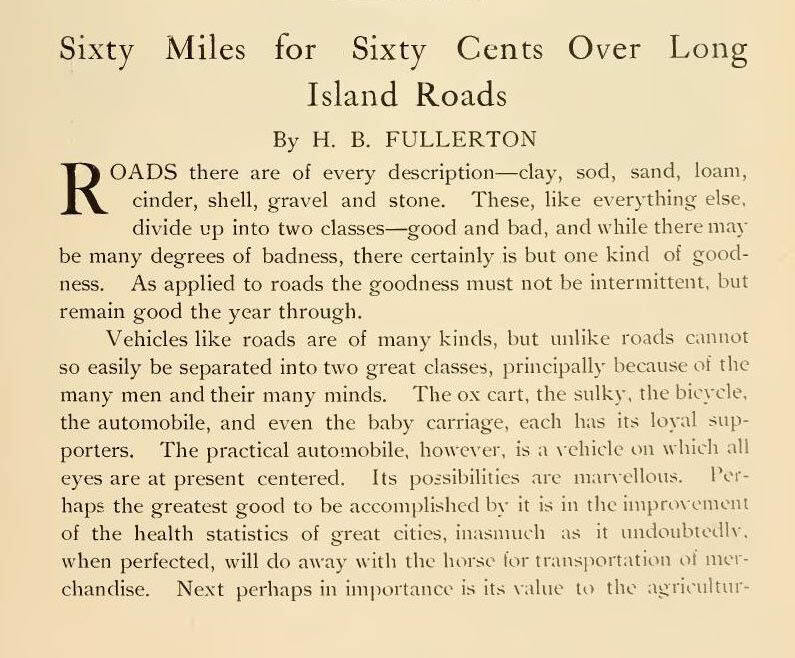 "During the whole trip no horse was unduly harmed, in fact the horses of Long Island seem to be growing used to the automobile, or at least, automobiles do not seem to create as much consternationas the bicycle did in 1896 an 1897." Being a big fan of history. The black beast is a top pick in my automotive favorites. Hi Rich, thanks so much! I’ve run out of time and officially giving up! I’ll just throw out a guess here and say that the man on the right looks like Louis Chevrolet in the passenger seat of a De Dion-Bouton in 1900/1901. The man on the left? Another stab in the dark and I’ll guess maybe A.R. Pardington? 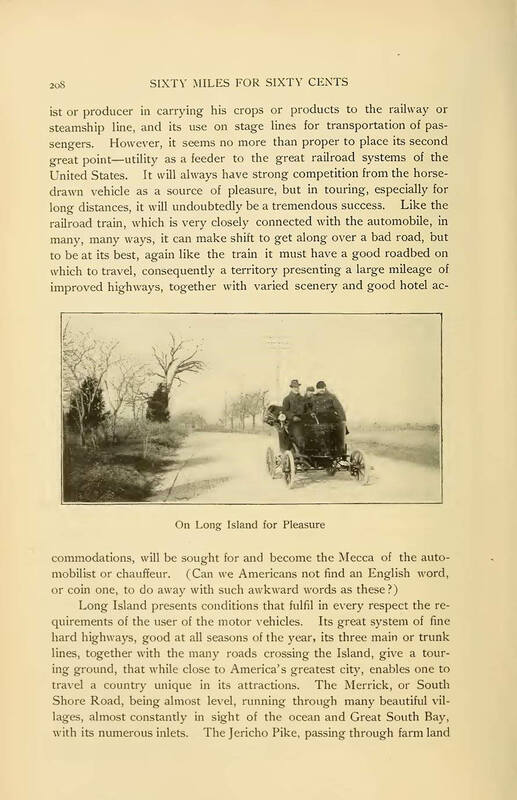 The photo appeared in the March issue of The Automobile Magazine Vol.3, 1901, describing a journey across Long Island with this car with a.o. driver H. B. Fullerton and passenger A.R. 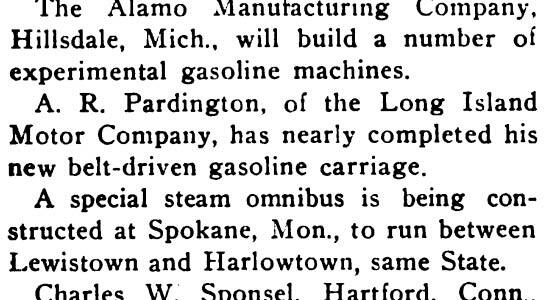 Pardington (involved in the LIMV Co.). This specific car was a surrey with the model name ‘Montauk’ (they used Long Island names for all their models). It was a motor car (not a steamer), but for specifications I must dig deeper. The Standard Catalog by Beverley Rae Kimes only mentions later products (from about 1902). The company was not a real car producer, but built on order. How many cars they built is unknown, but will not have exceeded more than a dozen or so, probably even less. Article from The Automobile Magazine is above. 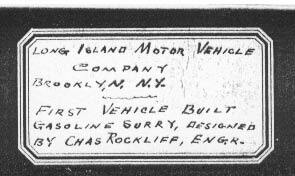 The Long Island Motor (Vehicle) Company remains rather obscure. The article in The Automobile Magazine, which describes the testing of a vehicle from this company, is in fact the first evidence of the company’s existence I could find (together with your find of course). 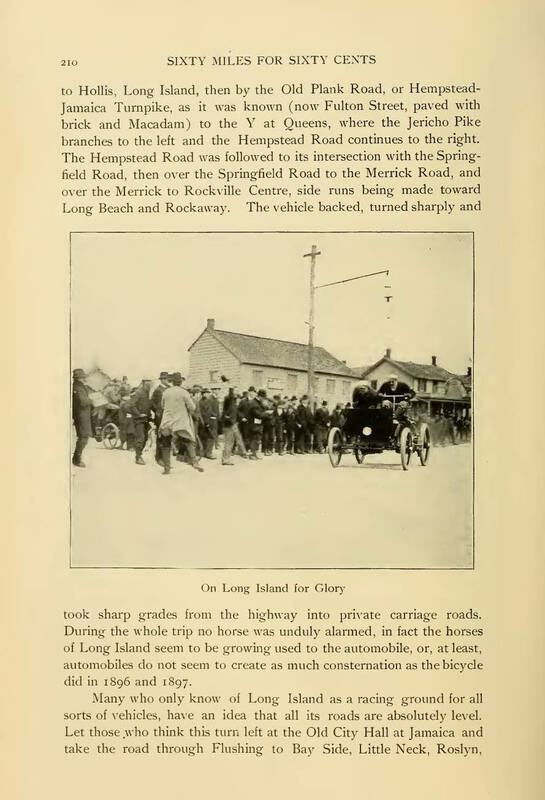 Apparently this vehicle was entered for the Long Island Endurance Run on April 20, 1901, but it didn’t show up (no reason given) (The Horseless Age: http://babel.hathitrust.org/cgi/pt?id=umn.31951000852669t;view=1up;seq=89). 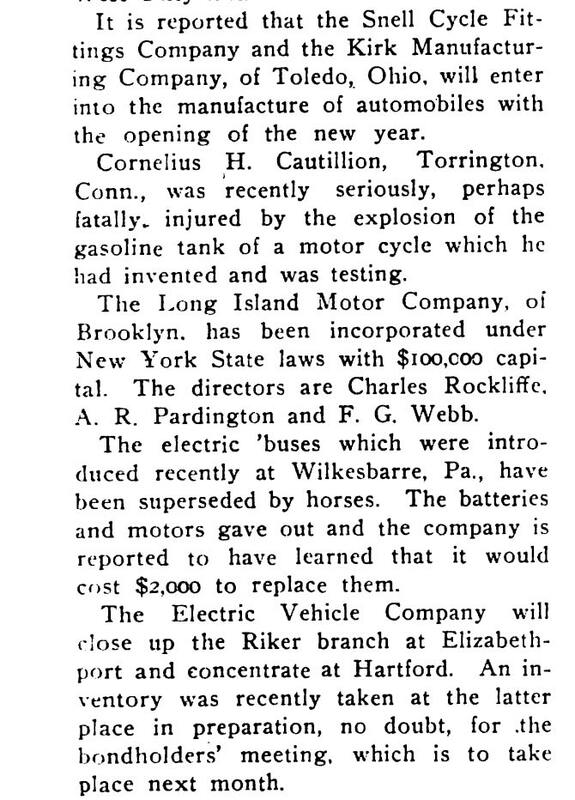 In The Horseless Age of October 30th,1901 p.647, the incorporation of the Long Island Motor Company (now without ‘Vehicle’) under New York laws was announced (directors Rockliffe, Pardington and Webb). On March 26, 1902 it was announced that Pardington had almost finished his new belt-driven vehicle. If this was the same vehicle as the one entered in the Long Island Endurance Run of April 26, I don’t know, but seems logical. The 24 hp car with driver Chas. Rockliffe received participant nr.64 and was by far far the heaviest vehicle in the contest with 3,500 pounds, but it could carry 6 persons (The Horseless Age: http://babel.hathitrust.org/cgi/pt?id=mdp.39015039811511;view=1up;seq=521). If the car actually participated is not clear. In the report of the run (The Horseless Age: http://babel.hathitrust.org/cgi/pt?id=mdp.39015039811511;view=1up;seq=531) it was written that no.64 was ‘failing to put in an appearance’. However, the car was seen during the run by several other participants: making repairs just beyond Manhasset (p.525), before reaching Bayside standing with engine or transmission trouble (p.531), between Bayside and Flushing (p.532, where the car was called patrol car) and between Lake Success and Queens, where the car was being towed (p.533). My guess is therefore that it made it to the start too late because of mechanical problems, started anyway and that these problems lasted during the run itself. After this event I couldnt find any info on the company, which is more or less in align with the info in Beverly Rae Kimes and Henry Austin Clark. 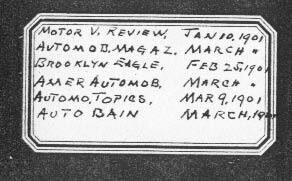 Jr.‘s Standard Catalog of American Cars (1805-1942). I’m a little confused, maybe I’m missing something. One sticker on the back states; ‘Passengers 4’, but the other sticker only names the 3 men seen in the photo. Could the unseen/unknown photographer be the 4th passenger? And unless there was a self timer, how could Fullerton be IN the photo as well as being photographer? Greg, H.B. Fullerton was the photographer for this photo and also the fourth passenger. Great information on this one. Ran out of time and energy tracking this one down. Howard this is amazing information! I am so pleased and impressed with the results! Thanks so much!